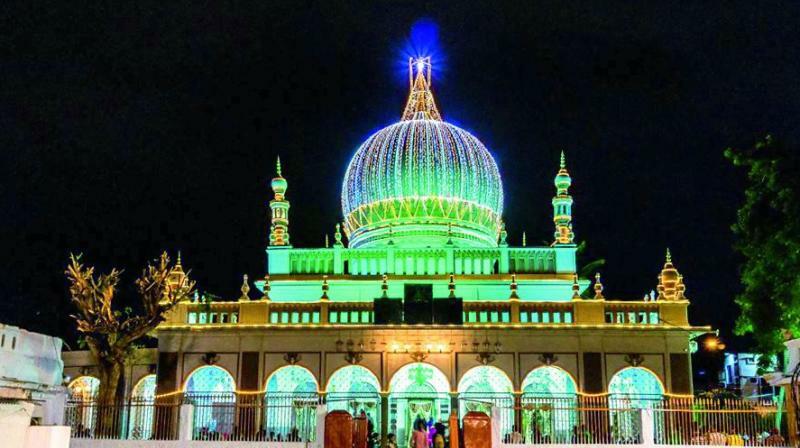 Hazrat Qibla Quddisa sirruh’s blessed birth took placein 1204 al-Hijri In the city of Mohaamadabaad in Bidar Shareef(present Karnataka, India). His Respected Father was from the Mashaiqeen and was a Pir-ut-Tariqa from the Blessed Nizamiyya Chishtiyya Order, his name was Hazrat Khwaja Sayyid Shah MeeraN Hussaini and was popularly known as Hussaini peeraN. Hazrat Qibla’selder brother was Sayyid Shah PeeraN Hussaini Sahab Qibla, and his younger brother was Hazrat Sayyid Shah Waliullah Hussaini and another younger brother was Hazrat Sayyid Shah `Ali Hussaini. Once during his childhood days Hazrat Shah Khamosh rahmatullah alaih was playing with some of his agemates. A Sufi Majzoob Hazrat Bandey Ali Shah happened to pass by at that time, he saw the youngHazrat Shah Khamosh rahmatullahalaih playing with his friends and said “You a Tiger are playing with these Jackals?” and made Hazrat Qibla eat some sweet from him. This incident triggered the beginning of a long quest for the Love of Allah Subhanahu wa t`aala.All the feelings of this young lad were overwhelmed by the quest for Allah and His love. Key saalik bey Khabar nabood az raah-o-rasm manzillaha. As to what is the “sajada rangi” who is the peer-e-MuGhaaN and what Mai is the Mai which is referred to here? It was soon that he asked his elder brother Hazrat PeeraN Hussaini permission to travel to further his Quest for the truth in the Path of Allah. Hazrat’sbrother gave him a servant to accompany him and aHorse as a means of conveyance. Hazrat left in his quest for knowledge of his Beloved Allah. As Hazrat Shah Khamosh reached a bit further out from Bidar, he gave the Horse to the servant and asked himto leave and started his journey on foot in his quest which took him first to Ajmer Sharif the place of restof Khwaja-e-Khwaajgaan Hazrat Moinuddin Chishti Rahmatullah alaih. Hazrat qibla remained at the Dargah of the Khwaja for many years doing Dhikr andTazkiyyatun Nafs until he was ordered by the Khwaja himself to go towards Punjab to Manikpur to Hazrat Haafiz Moosa Sahab to obtain the zaahiri faiz of his destiny. Before Hazrat Qibla reached Manikpur Hazrat Haafiz Qibla saw Hazrat Gharib Nawaaz in his dream who said“My child is coming to you Take him with you”. It is recorded in most of Hazrat Shah Khamosh’s Biographies that the Dhikr of Hazrat Shah Khamosh used to be very intense and continuous , It is reported that not a single breath left his body without experiencing the sweet taste of Dhikr. It was due tothis reason that for thirty years of his life he seldom used to talk and used to convey his thoughts by actions and that too very occasionally. He was then Given khilaafah by Hazrat Haafiz and was ordered to stay in Amroha uptil Hazrat Haafiz’ lifetime and then go and preach and stay in Deccan. 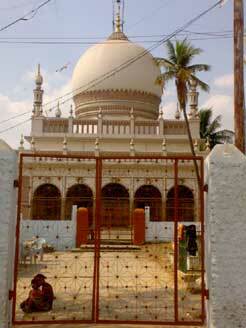 Hazrat Haafiz said to Hazrat Shah Khamosh thatHazrat Ghareeb nawaaz has gifted you with the Qutubiyyat of Deccan. On his arrival in Ajmer Sharif Hazrat Shah Khamosh was taken to the Dargah Sharif by his Vakeel at the Dargah Sharif as per tradition. His name Sahibzada Syed Murad Muhammad. Original handwritten vakalatnameh of Hazrat Shah Khamosh is still preserved in Ajmer Sharif at the Khaneqah. Please add up this piece of information too. Original persian written Vakalatnameh could be seen.